Each Division was allocated a Pioneer Battalion. The 5th Pioneers belonged to the 5th Division as indicated by the vertically aligned rectangular colour patch. Their skills and capability were broad from building, construction and maintenance to road and track preparation and maintenance. They could also, and did quite often, fight as infantry. Although they had existed in the Indian Army before 1914, Pioneer Battalions were used on a large scale by Commonwealth forces on the Western Front during the First World War. Because of its largely static nature, there was a much heavier reliance on field defences and the provision of mobility support to get people, weapons, ammunition, rations and stores up to the front and casualties out. Roads and railways needed to be built maintained and repaired. While these were also Engineer tasks, Engineers alone could not meet the heavy demand, while riflemen were always needed at the front. Therefore, Pioneer Battalions were raised to meet the needs of both and trained to support both engineers and infantry. 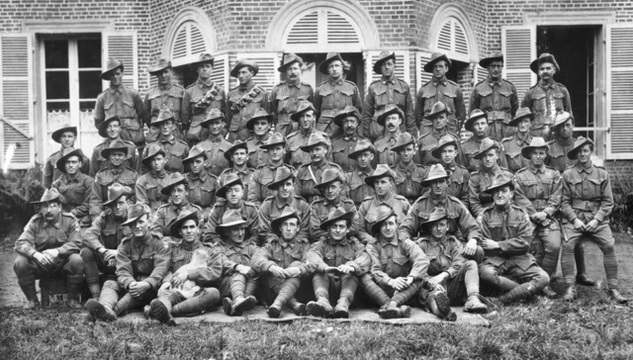 The 5th Pioneers were raised in 1916 and were engaged in every action undertaken by the 5th Division, starting at Fromelles, then the follow up of the Retreat to the Hindenburg Line and Third Ypres in 1917, the stemming of the German tide in the Spring Offensive of 1918, "Peaceful Penetration" and the Hundred Days campaign in late 1918.